Start with ripe oranges or tangerines, grapefruits, or lemons (we’re using an orange here, but the principle is the same for all citrus). You can even cut limes into supremes if you're feeling adventurous. Look for citrus fruits that are firm and feel heavy for their size. Using a sharp knife you can easily manipulate (that is, one that fits well in your hand - shown here is an 8-inch chef’s knife, but a 6-inch, boning, or paring knife, as long as they are sharp, all work fine), cut off the ends of the fruit. Cut off enough to reveal a clear circle of fruit on each end. Stand the fruit on one of its cut ends. Cut away a section of the peel and pith, cutting down from the top to the cutting surface. Be sure to remove enough peel to reveal the fruit — this first cut will serve as your guide for the rest of the peeling. Continue to cut off peel around the fruit. Notice that you will sacrifice some fruit in order to remove the peel and pith in their entirety. If you’re feeling ambitious you can try and cut as close to the peel as possible. 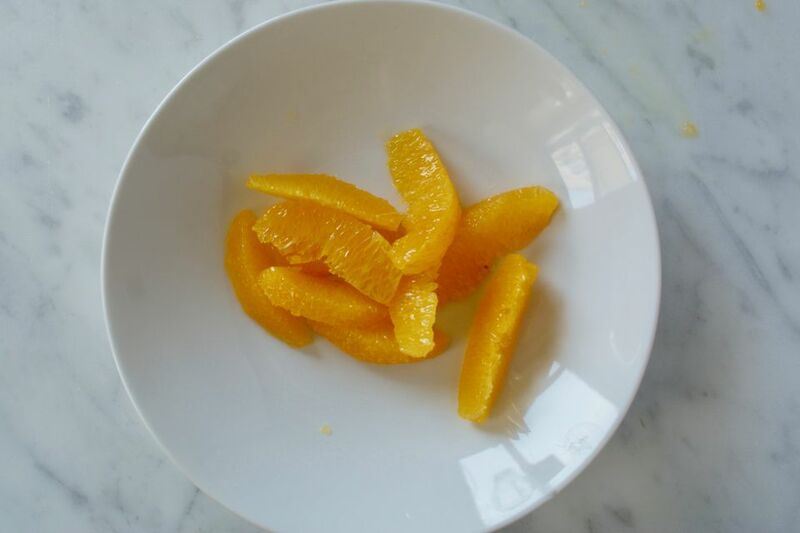 Hold peeled fruit in your hand (over a bowl to collect juices, if you like). 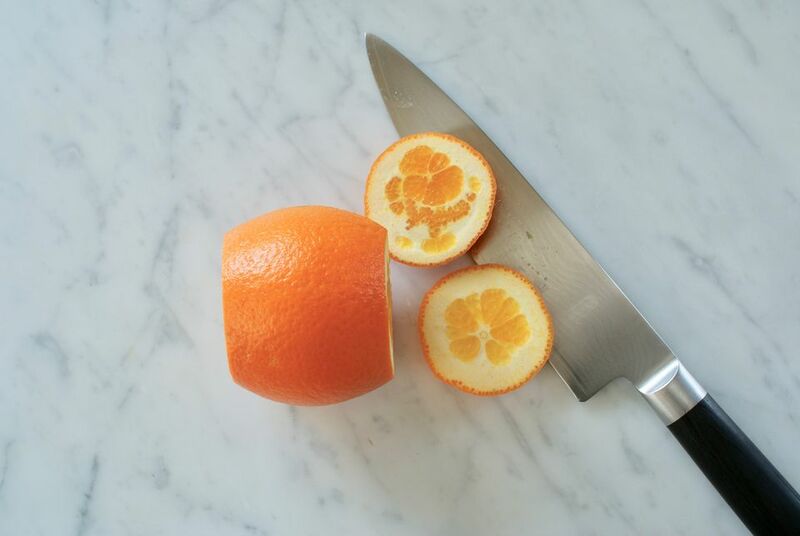 Using the same sharp knife, cut between one section of fruit and the membrane separating it from the next section into the center of the fruit. Cut between the other side of that same section and the membrane on the other side. By following the membrane on each side you will necessarily cut at angles towards the center of the fruit, releasing the section. Repeat with the section of fruit next to the one you’ve just removed, cutting between the membrane next to the now-removed section and the next section. Continue with remaining sections. You will end up with a juicy handful of citrus innards in your hand. Squeeze the juice over the sections, if you like, and discard remains. Enjoy the sectioned fruit on its own, with other citrus mixed in, tossed in a green salad, or used in a more elaborate fruit salad. Note that this method is especially useful if you get your hands on blood oranges since they are more difficult to peel than other oranges and they show off their brilliant color best when free of pith and membrane. Citrus supremes are perfect in Fennel, Grapefruit and Arugula Salad, Beet and Orange Salad, or Citrus Pomegranate Salad.